← Super Bonk (SNES) Review – Classic, but Crazy, Platforming Fun! This one is a new review! Just played this game this week. Publisher: Originally released in Japan by Media Group (2000). Re-released in Japan by Hamster (2003). Released in the US by Agetec (2003). Released on Playstation 3/PSP PSN (digital download) by Hamster (JP only, 2008). 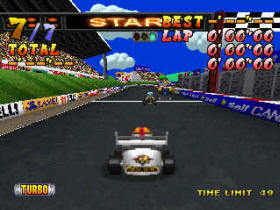 Extreme Go-Kart Racing is a kart-racer themed, but drift-racer playing, super low-budget racing game released late in the PS1’s life. The game is a budget game released for cheap, and you can very much tell. I got this game fairly recently, and beat the game quickly; somehow the challenge made me want to get through the game. The game is bad, and super low budget, but it is a little interesting. Yes, despite the title, this is a drift-focused racing game; it’s not really a Mario Kart clone. The Japanese title has “Drift” in the name, which is a more accurate name than the US title. This game has no weapons, either. It is about perfecting perfectly timed, Ridge Racer-esque auto-drifts. It works just like in some of the Ridge Racer games: to drift, let go of accelerate, hit drift, then hit accelerate again when you’re pointing in the direction you want to go. Also, the game has absolutely no analog support, insanely. The Dual Shock controller appears in the control settings menu, but the analog sticks do nothing, in the US release of the game at least; this game is d-pad only, shamefully for a game released in 2000 in Japan and 2003 in the US. That is, unless the Japanese version had analog and they pointlessly cut it out of the US version; the Japanese case back does have teh analog controller logo. I don’t know if that version actually has analog or not, though, but I will try to find out. Anyway, this game does not look as late a PS1 game as it is! These graphics would have looked old years before this games’ release, even for the PS1. There are seven tracks in the game, and no difficulty settings; seven races and it’s over. That doesn’t mean winning will be easy, though. This is a hard game, for both good and bad reasons, and beating the game will require a lot of practice in a game of quite questionable quality. Is it worth it? I’m sure many people would say no, but I had enough fun to stick with it, I guess. Mode options are only the basics: two player splitscreen, single race, championship mode, or options (control settings and audio levels). You can also save here, but NOT during a championship; that you have to complete without turning the system off, annoyingly. You have infinite continues, but can’t save your current circuit. Unfortunate. It does unlock tracks as a starting point as you reach them, but doesn’t save your current game. Once you start a race, you’ll notice how long the load times are in this game. As fitting with the general dated nature of the game, the loading times in the game are far longer than they should be, and are definitely irritating. Before each race there’s an untranslated line in spoken Japanese about the upcoming track. Lazy localization work there. In championships, you progress to the next race by finishing at least third in each race, and though there are only seven racers in each race, this is a challenge. Championship mode doesn’t really have an ending at the end, just credits with a generic (same for all characters) CG background. Disappointing! I was hoping for more. At least completing tracks does unlock them, so in the future you can start a circuit from any of the tracks. Still, with a game as frustrating as this one, I was hoping for better when I finally managed to beat it,and yes, finishing it was an effort. I’m not sure if it was worth it or not, but I completed it anyway, once at least; I’m not sure if I will again. Anyway, once choosing a mode, you then choose a racer. You start out with seven options, all stereotypical anime-kart-racing characters. There are four more unlockable ones, though I have no idea how to do that. The character stats do matter — larger racers really do control differently from smaller ones, for example. So that’s good, at least. Again like Ridge Racer, this is a catchup-centric racing game, not one where all the racers start at the starting line together. You start at the start line with two other racers right in front of you, but the other four opponents start far ahead, just like in classic Ridge Racer games. This way there are fewer sprites to render at once! Catching up to the leading four requires good play and practice. You can get a fast start with proper timing of the accelerator button. Hold the accelerator from the moment the game finally finishes loading, let go just as “1” appears on the screen, and then hit the accelerator again when the race starts. This should start you at top speed right out of the gate, an extremely useful advantage. Learn the timing for this. I often would just restart a race if I messed it up and spun out instead of got the turbo, because that delay would be hard to make up for. One of your two rivals at the line quickly falls behind in last, but the other one tracks you and is your toughest opponent. In each game you’ll have one other racer as your rival throughout the circuit, but who it is is different each time. This racer is also the one who appears before races, giving you some little hints. The text is always the same, though; only the racer pictured changes. I never finished in the top three in a race on my first try, it always required spending time memorizing the track, because you need to learn the turns — which should you drift on? Drifting is faster than slowing down, of course, but mess up and you might need to restart the race; you cannot make many mistakes and do well. I finished the game, but I don’t know if I ever even SAW the person in first place; I mostly moved on with third-place finishes, and a few in second. Winning would require even more practice, and this game is not anywhere near fun enough to be worth it. During the race, your primary task is to memorize the course. Most of the seven tracks are too narrow, and so not hitting the walls is frustratingly difficult. As I will describe, walls are a major threat in this game. Sort of like Mario Kart on the SNES, tracks are entirely flat; this game does not have any hills on the courses. It’s quite dated in that respect. 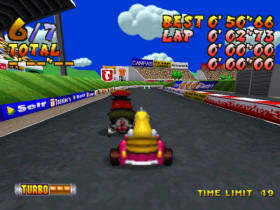 Each track has a different setting, at least, mostly in kart racer-style environments. My favorite was the last track, which was inspired by Rainbow Road, of course; the gameplay may not be Mario Kart at all, but the graphical design very much is. The last track is fun because it’s wider than the others. It has no walls, but the wider size makes it more manageable. Tracks are littered with Turbo powerups, each of which gives you a different amount of turbo. Once you build up enough, you can use a turbo. You can’t store more than one at a time, but once used turbos last a reasonably long time and significantly increase your speed. Drifting and turbos are the keys here, but both must be PERFECTLY timed, because one of the games’ most frusrating design choices: if you ever touch a wall, you spin out and lose almost all of your speed. Touch one wall and you lose a LOT of time, and likely a position or two as well. So, turbos can only be used in very specific locations! This is really a key point: you need to learn where you can use turbos. Some tracks mark spots where you should use turbo with signs that say “Turbo” on them, but also try to find other spots you can use turbos. Some tracks have them. The hardest thing in this game would be trying to make corners while at turbo speeds. So far at least, I’ve found that near-impossible; you can barely turn normally while in turbo, and while you can drift, you’ll need to start the drift even earlier in order to make it at high speeds. And of course, if you mistime it, you’ll hit the wall and waste the whole effort. On the whole, Extreme Go-Kart Racing is a pretty awful game. The description above may not sound too bad, but the controls are not very good. Car control is touchy, and getting used to the controls takes time and doesn’t work as well as it should. Drifting is also frustrating because of how narrow most of the tracks are; it’s far, far too easy to hit the sides over and over. Also, of course, I haven’t mentioned the graphics much yet, and that’s because they are bad. This game has some of the worst polygon-seam-popping issues you’ll find! Sure, all PS1 games have polygon issues, because the hardware does not have perspective correction, but better games try to cover over the problem. This game, however, doesn’t do a thing, and so visible broken polygon seams can, and often do, appear between every single polygon in this game. The polygon count is low, too, and characters are sprites, not polygons. Environments don’t have much to them. The game doesn’t have popup, as you can see to the horizon, but with environments this low on detail, that isn’t saying very much. The PS1 can do far better than this. When combined with the frustrating controls and lacking featureset, this game is not very good at all. With practice you can get better at the game, but the question is, is it worth it? No, it probably isn’t. On the other hand though, the music is nice. Music does play during races, and it’s reasonably catchy stuff. I didn’t remember any of it afterwards, but none of it was bad either. Decent work. So, overall, this is a pretty awful game, and I wouldn’t recommend playing it, but it was just playable enough that I stuck with it to the end despite how poor and frustrating a game it is. Extreme Go-Kart Racing is a budget game, clearly made on a miniscule budget. This game appears to be a cute kart racing game at first glance, but it’s really more like Ridge Racer crossed with Power Drift, or something like that. Unfortunately, being different doesn’t mean that it’s any good, of course. With only seven short tracks, few options, long load times, no analog controls (in the US version anyway) in a game that needs them, frustrating crashes whenever you touch almost anything, and not-so-good gameplay, this game won’t last long. On the positive side the music is okay, graphics are decent (for something from years before its release), character designs are solidly drawn and amusing, you do eventually start to get used to the poor controls with practice, and the game is playable and definitely requires some skill to master. Just finishing a circuit with all third-place finishes won’t get you everything in the game, either; and even though I finished the circuit and saw the credits, it didn’t unlock any of the four unlockable characters. My only guess is that you have to get first (or maybe second) place finishes in most or all races? I don’t know; the manual doesn’t explain it, and despite searching I don’t see anything about it online. But still, even if I almost never finished above third, I did complete the championship and see the credits, so that counts as a win! This game was hard; each track took a lot of practice. You basically have to be near-perfect in order to actually finish in the top three, and I almost never managed to even SEE the person in first. Perfect those perfectly-executed drifts! Or don’t bother, and pass on this subpar budget game. That would probably be the better approach. This game had potential, but it was not realized. 6.8/10 (D+). This entry was posted in Classic Games, Full Reviews, PlayStation, Reviews and tagged extreme go-kart racing, kart, kart race kimete wa drift!, power drift, Racing, ridge racer. Bookmark the permalink.